[http://] Welcome to R. K. EnterprisesExporter & Supplier of Testing & Measuring Instrument. The company was established in the year. 1987. We are well known in the market for our technicallysound infrastructure & utmost client satisfaction. Our industry leading prices & wide distribution network make us unique in the market. We offer a wide range of premium quality Measuring Instruments and their spare parts. Our Non Destructive Test equipments & Testing Instruments are extremely reliable. Electronic Measuring Instruments, Jewelery Tools & Gauges are some of our best selling products. 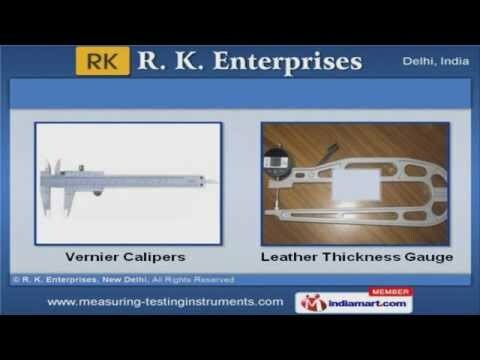 We also provide Vernier Calipers & Leather Thickness Gauges that are widely acclaimed in the market. Along with that we provide Digital Thickness Gauges & Vibration Meters that are a class apart. We are specialized in manufacturing Micrometers Measuring Instruments.